Taste test: These have the same look and texture as the regular Cape Cod chips. When you first bite in, you get the same excellent crunch, but it quickly becomes clear that they don't have the same flavor, because they have hardly any flavor at all. This is typical of no-salt chips. If you eat a couple of chips all at once and chew for a few seconds, you do get some nice potato flavor, but the lack of salt definitely has had an effect on these chips. 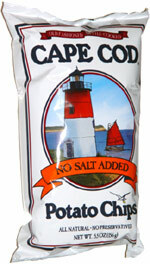 Smell test: Smells good, the same as the regular Cape Cod chips.